This gite is very quiet, and recently completely renovated. The view is fantastic and very wide. The whole is surrounded by a large area of ​​over 18 ha which is very good for the peace.The gite consists of 2 parts, (7 and 2 persons) each with its own entrance, which are connected to the main house. There the owners live with their 2 child-friendly dogs, but they will do their utmost to respect your privacy as much as possible, but are there for you if you need them. 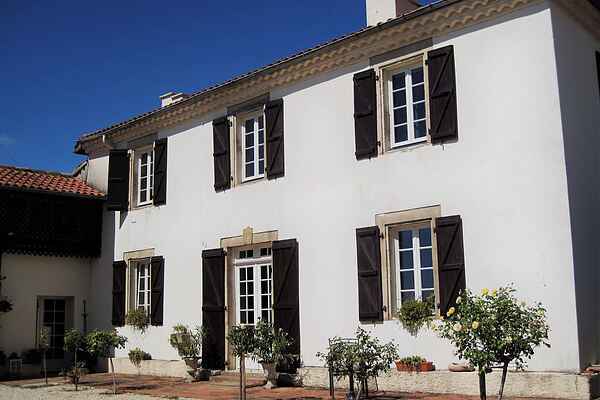 The large gite has 3 bedrooms, a spacious and very well equipped kitchen, 2 bathrooms. The small gite has a bedroom, bathroom and kitchenette.The large pool with pool house is completely private, and around you will find a lovely terrace with lounge chairs and parasols. There is something for everyone here; idyllic villages, exuberant markets, village festivals, brocantes and the many flea markets. But also the more active traveler can go here: golf at the Golf du Chateau de Barbet, water sports at the Lac de la Gimone, with a canoe on the river Gesse and much more. The spanish border is only an hour away, and Lourdes is a must!